Preserving a Peck of Potent Peppers. Enamored with names like 'Burmese Looking-to-the-Sky' and 'Chinese 5-Color,' I purchase too many seeds of too many varieties of hot peppers. 'Scotch Bonnet' and 'Fish Pepper'--really, how can I resist? I can justify the purchases and the work in growing them—they're for my business, of course. But then I begin planting our family garden, and suddenly I'm squeezing pepper plants in every available extra bit of sunlight that I can find. This year, 30 hot pepper plants consumed the garden. Our abundance of hot peppers would make sense if we often cooked exotic, spicy meals. Occasionally, we try interesting recipes. But the reality of life with two younger children means that mealtime relies on tried-and-true basics. After all, it's enough work to cook dinner after running the kids to horseback riding lessons, soccer, chicken shows, or play dates. Preparing a hot-and-spicy meal that no one will eat isn't worth the effort. Still, the peppers overrun the garden. Bags upon bags of hot peppers line the shelves in the refrigerator. Every time I walk to the back garden, I return with a shirt full of hot peppers. Thankfully, college son and his girlfriend love hot peppers, so I always count on them to take a bag back to school. They even made hot sauce a few weeks ago. While I haven't attempted hot sauce yet, I decided it's time to take charge of the plethora of peppers. After all, I can't stand wasting perfectly good produce, especially food that I've nurtured from seed. Plus, earlier this year, I set a goal to learn how to preserve food. Faced with my bounty, it was time to live up to my self-imposed challenge. PLEASE NOTE: Treat yourself to plastic gloves before you begin working with hot peppers. Trust me. There is nothing worse than cleaning and cutting hot peppers, then later removing your contacts. Also, handling lots of hot peppers, particularly the seeds and membranes, can burn your skin. Please, please—wear the gloves, even if you think they're dorky. For all types of preparation, make sure to wash the peppers and dry them well prior to use. Drying peppers in the oven is simple—but quite honestly, it took a long time. An unexpectedly long time. Much, much longer than any instructions mentioned. And our house smelled rather...spicy, to put it nicely. I used the setting on our oven for dehydrating. Honestly, you don't need a special setting. Set your oven to its lowest temperature. If you do not have a convection oven, leave the oven door slightly open to allow air circulation. Arrange peppers in a single layer on a baking sheet. Initially, I began the process with whole peppers. However, because several varieties were not drying well due to thick flesh, I cut them in half to help aid drying. Most recommendations I found suggested drying the peppers in the oven for 12 hours. After 12 hours, I halved the peppers. Still, I found that the peppers required another 24 hours in the oven. Dehydrating peppers in the oven is extremely easy—but it definitely ties up your oven. If you have a food dehydrator, a friend recommended setting up the dehydrator outside to avoid the noxious fumes that might make your children run away from home. Once the peppers finish drying, let them cool. You can either store the dried peppers whole or crushed. Because I needed to save space, I chose to crush the peppers. Again, be careful with the process. ...then crushed the peppers using a rolling pin. (It's very therapeutic!) Even with the peppers contained in the bag, enough dust and fumes escaped to cause a pretty nasty coughing fit. You might consider wearing a mask. While slightly hazardous, the end result looked good—a nice jar of pepper flakes, ready to use. I'm not sure why I find canning so daunting. My first attempt at pickling peppers seems successful. I suppose the true test comes this winter, when we open the jar. Still, the process is simple. Leave peppers whole or cut into 1-inch pieces. Mix peppers together. Combine vinegar, water, and garlic in a large sauce pan. Bring mix to a boil, then reduce heat and simmer for 5 minutes. Remove garlic. Pack peppers into hot jars, leaving ¼ inch headspace. Ladle hot liquid over peppers, leaving ¼ inch headspace. Remove air bubbles. Adjust two piece cap and tighten on jar. Fill a large canner or stock pot with water. Heat water until boiling, and place jars into the pot, making sure the water covers the entire jar (including the lid). Process for 10 minutes. Remove and allow to cool. is a marvel—check it out for other great recipes. Honestly, if I possessed unlimited freezer space, freezing would be my choice of preservation. It's so simple. 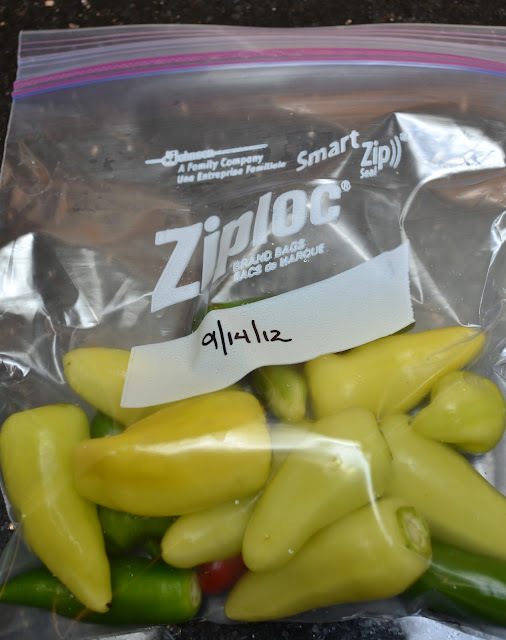 Wash peppers, dry peppers, put in freezer bag, remove excess air, label with date, and store. That's my kind of food preservation! The drawback of freezing: lose your electricity, lose your food. For people looking for food security, freezing might not be the best option. I'm torn. That's why I'm trying lots of options this year. I've always loved gorgeous ristras hanging in kitchens, with dried peppers within easy reach for use. 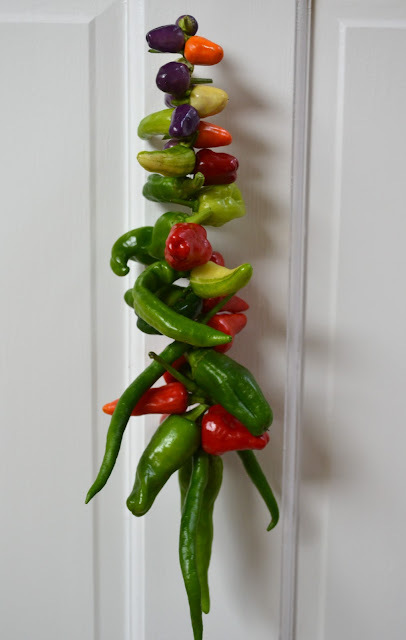 The key to making a ristra is to use peppers that can dry easily. You don't want to use peppers with very thick flesh, as they tend to mold instead of dry. To make a simple ristra, thread fishing line through a needle and make a large knot at the end of the line. Push the needle through the stem base of the pepper, stringing the pepper to the end of the line. Continue to add peppers, leaving enough space between peppers for good air circulation. 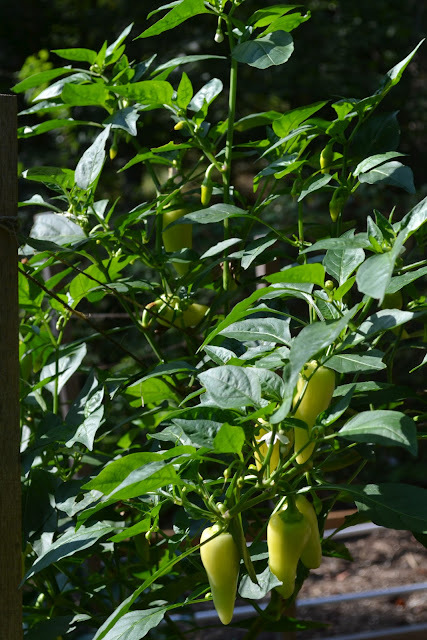 When you have strung the peppers, tie off the line at the top. Hang the ristra to dry, which may take several months. for you to try from one of my favorite foodie blogs, Orangette. 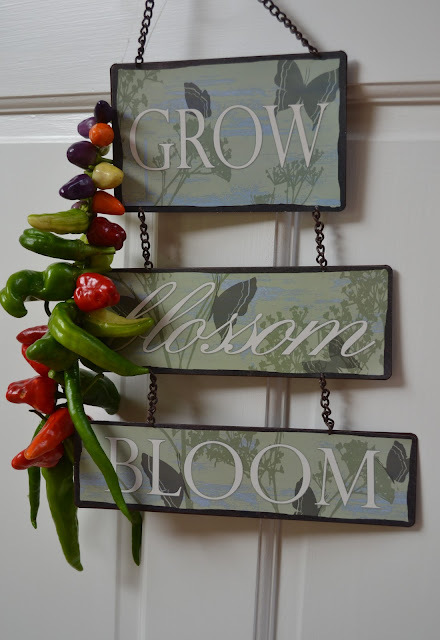 Do you have a favorite recipe for using fresh hot peppers? If you do, would you please, PLEASE share it? Because when I was in the garden yesterday, I found literally hundreds of hot peppers, waiting to be harvested. Next year, I promise—I will be strong and resist all of those intriguing chile names. Good luck with your peppers—I'd love to hear how you preserve your peppers.